There are 81 Assisted Living Facilities in the Dunedin area, with 10 in Dunedin and 71 nearby. The average cost of assisted living in Dunedin is $3,195 per month. This is lower than the national median of $3,346. Cheaper nearby regions include Palm Harbor with an average starting cost of $2,995. To help you with your search, browse the 504 reviews below for assisted living facilities in Dunedin. On average, consumers rate assisted living in Dunedin 4.1 out of 5 stars. Better rated regions include Palm Harbor with an average rating of 4.3 out of 5 stars. Caring.com has helped thousands of families find high-quality senior care. To speak with one of our Family Advisors about assisted living options and costs in Dunedin, call (855) 863-8283. Hope Enterprises Of America Inc. Located just north of Clearwater on Florida's west coast, Dunedin is known for its Scottish celebrations, subtropical setting and proximity to the unspoiled Caladesi and Honeymoon Islands. It also home to 10 assisted living facilities with another 52 in nearby areas such as Clearwater, Palm Harbor and Tarpon Springs. There are different types of assisted living homes in Florida. While all provide meals and offer some form of assistance with daily tasks like dressing and personal hygiene, some have special licenses that allow them to provide services to residents with more significant needs. The cost of living in Dunedin is right on par with the national average. Seniors coming from areas with a lower cost of living may need to adjust their budgets. If you're coming from a state that taxes SSI benefits and pensions, you may find Dunedin to be more appealing. Florida does not have a state income tax, although there is a sales tax on most purchases. If you like long, hot and humid summers with lots of thunderstorms, then Dunedin may be for you. Average summer highs are around 90 degrees, and winter lows are typically above 50, but it does occasionally get cooler. Dunedin also gets about 33 percent more rainfall than the national average. Dunedin is a member of the AARP Network of Age-Friendly Communities. According to AARP, this means its elected leaders have committed to making the community senior-friendly. Dunedin is a relatively safe city with 1.48 violent crimes per 1,000 residents per year. By comparison, the national average is 4 violent crimes, and the average in Florida is 4.3. The Pinellas Suncoast Transit Authority (PTSA) provides buses throughout the county and also offers Demand Response Transportation (DART) vehicles for eligible persons who are unable to use the bus system. Seniors age 65 and older receive discounts up to 50 percent off of regular fares. Assisted Living costs in Dunedin start around $3,195 per month on average, while the nationwide average cost of assisted living is $4,000 per month, according to the latest figures from Genworth’s Cost of Care Survey. It’s important to note that assisted living rates in Dunedin and the surrounding suburbs can vary widely based on factors such as location, the level of care needed, apartment size and the types of amenities offered at each community. 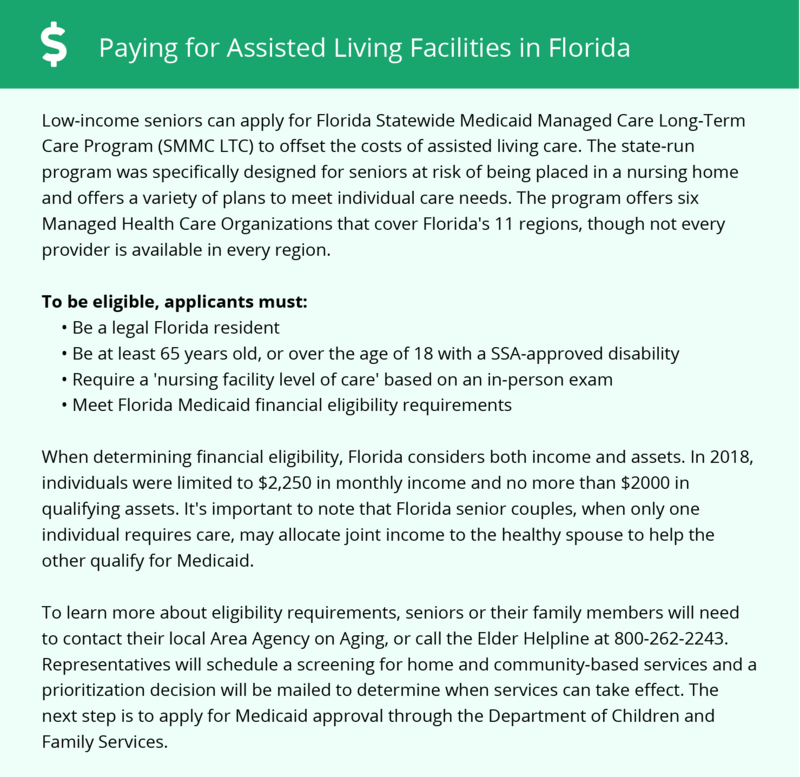 Florida provides two programs for low-income seniors that can help cover the cost of services at assisted living care facilities. The Medicaid Long-term Care and Assistive Care Services programs don't cover the cost of room and board, but the state does allow for family supplementation without impacting Medicaid eligibility. Florida also provides optional state supplementation (OSS) to residents who receive Federal SSI payments. Dunedin and the surrounding area are home to numerous government agencies and non-profit organizations offering help for seniors searching for or currently residing in an assisted living community. These organizations can also provide assistance in a number of other eldercare services such as geriatric care management, elder law advice, estate planning, finding home care and health and wellness programs. To see a list of free assisted living resources in Dunedin, please visit our Assisted Living in Florida page. Dunedin-area assisted living communities must adhere to the comprehensive set of state laws and regulations that all assisted living communities in Florida are required to follow. Visit our Assisted Living in Florida page for more information about these laws.